“How do you wear heels everyday?”, “Don’t your feet hurt?” – two questions I get asked on the daily. 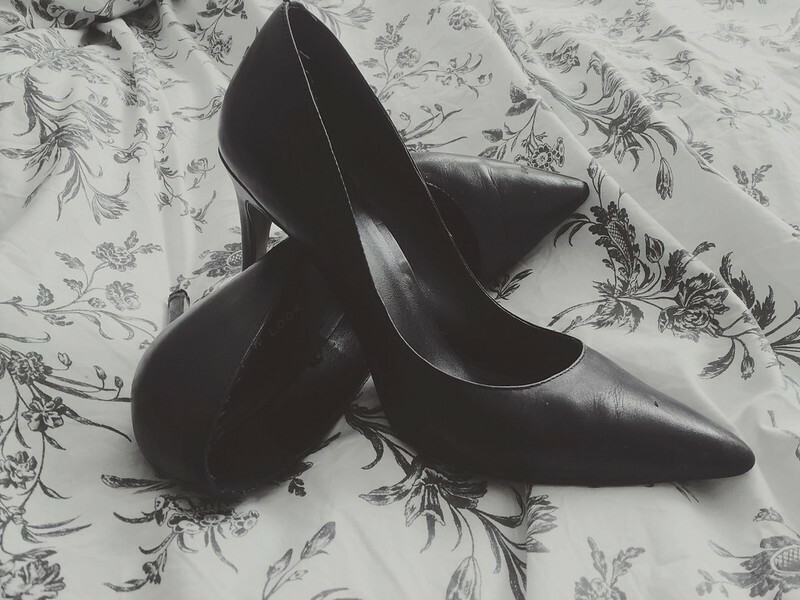 Whether it’s the 9-5 grind or a night out in town, I’ve worn heels ever since I can remember – some even joke I was born in heels. So as it’s a topic I get asked for advice on, I thought I’d pull together my top tips, my insider knowledge if you will on how to wear and walk in heels. There’s not one rule for them all. From court shoes to slingbacks and peeptoes to platforms, heels are like people. They all look different, feel different and have their own personality. So approach with caution. Just because your trusty ankle straps once served you well, doesn’t mean that new pair in store will follow suit. Just like most things, practising walking in heels will help. Wearing heels is a great workout for your calves, helps your posture and will improve your heel walking confidence. Wear around the house or office to break in but be prepared for pain – this ain’t no honeymoon period. Okay, okay, size DOES play a small part in heel pain but 90% of the time it’s down to the heel width. The thinner the heel, the less support your foot has thus inducing pain, whereas the thicker the heel, the wider the area your foot has to balance on. Simples. So unless you’re a confident heel wearer, avoid the stiletto type shoes and opt for a block heel. Years of heel wearing has taught me one thing – stay away from a rocky shoe. Most of you at this point will be like ‘Huh? !’ What I mean is, take a look at the side of your shoe. Does the front flatly touch the ground or does the toe raise up? If it’s got a curve at the front, I dub these ‘rocky shoes’ as when you have them on and lean forward you start to rock/fall. I’ve fallen victim to buying these and for me, whether I’m stone cold sober or have ‘had a few’, I fall over every couple of hours or I have zero confidence to make the tiniest of strides. Anyone who can conquer these heels – I applaud you. In my experience, stick with a shoe that lines up with the floor. I can’t guarantee you won’t EVER fall over, but they’ll help. A lot of people think investing is always best. Forget that – money doesn’t always buy the best. Some of my best shoes have been high street heroes and my most painful pair to date have been a very famous designer shoe costing over £500. So forget the price tag and pay attention to the shoe in question. When in store, take a few laps of the area, check whether they’re rocky. If they hurt in store, they’ll hurt most of the time. Yes, some shoes are exceptions to this rule but you shouldn’t have to break in many shoes. Pain comes in many forms so approach the shoe as a hole. Peeptoes look cute but can cut off the front of your foot. Some stiff finishes e.g. patent can rub your feet and ankle straps are a whole other kettle of fish. They can dig into your ankles, require weeks of plaster wearing and leave you looking like you’ve been battered. I, for example, can’t wear asymmetric open sided shoes as my feet don’t feel supported. As I’ve said, I’ve worn heels my whole life. I’ve worn them for formals, for nights out, for work, on holiday, to perform in – and even I can’t wear them all. I never like being ‘that girl’ that moans about her heels so it’s why I take the time to pick the right ones. Find what works for you. As a general rule, no matter the heel I’m wearing, unless I’m feeling 100% confident, I ALWAYS carry flats as back-up. This is especially important on a night out. You never know when you’re going to be walking a long distance or you may just be ‘over’ your six-inch stilettos, so plan. As the old saying goes: fail to prepare and prepare to fail. Okay so I’m kinda stealing this one from Cher here – Horowitz, not the singer, but hey! Some shoes aren’t all-rounders. Some will have your back through the thick and thin – they’ll share many a countless night, help you feel kickass in that all-important meeting and mean you look semi-sassy running across the platform to catch the 10:32 to London Euston. These old faithfuls will be re-heeled time and time again and will hold lots of memories. Not all of your shoes will be like this. Some may just be there to wear when you get to where you wanna go or may look pretty but hurt like hell. From far away they look on-point in more ways than one, but up close and to the owner – not so much.